The parsnip (Pastinaca sativa), like the carrot, is a member of the parsley family. It usually requires 2 years to complete the life cycle, i.e., to produce the large, branching flower stalks which are 2 to 3 feet tall. The plant is grown as an annual for its long, cylindrical, tapering, fleshy taproot. It is a slowly growing, long-season, very hardy plant. The roots are frequently left in the soil over winter where they are unharmed by freezing. Although the parsnip is a very common vegetable, it is of rather minor importance commercially. Parsnips of the Hollow Crown variety were planted Apr. 24 in rows 18 inches apart. After the seedlings were well established, they were thinned to 5 inches distant in the row. Early Development.--By June 18 the plants had a height of 4 to 5 inches and a top spread of about 4 inches. Each plant was furnished with four leaves. The total leaf surface was 19 square inches. 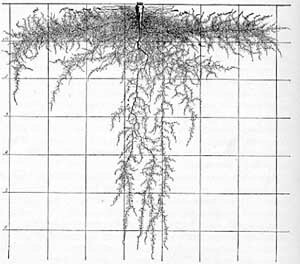 The extent of the root system was quite marked considering the rather meager development of the aboveground parts. Very slender taproots penetrated vertically downward except for small twists and turns. Depths of 19 to 28 inches were found on the several plants examined. Figure 65 shows the characteristic branching habit, abundant laterals, both short and long, extending outward in a nearly horizontal direction on all sides of the taproot. Usually no laterals arose in the surface inch of soil, and long ones arose only at a soil level deeper than 3 inches. Fig. 65.--Taproot system of a young parsnip of the Hollow Crown variety. This plant was only 8 weeks old. The average lateral penetration in the surface foot was somewhat less than 3 inches, but the maximum lateral spread was 9 inches. In the second foot the branches were younger and shorter, often only 0.2 inch in extent. The ends of the taproots, as well as the laterals, were quite unbranched. In fact many of the shorter laterals were simple. The longer ones were furnished with short branches (usually only 0.2 to 1 inch long) mostly at the rate of 3 to 5 per inch. These, however, were confined to the older parts and were only rarely rebranched. In regard to the number of main laterals, these varied from 4 to 13 per inch of taproot, many counts giving a mean of 8 per inch. They were very fine and uniformly distributed. The entire root system of shining white roots was rather simple and was excavated with relatively little difficulty. Midsummer Development.--During the following month the plants made a good growth. They were again examined on July 14. The shoots were over ½ inch thick at the base and about 15 inches tall. They had a total spread of 6 to 12 inches. The leaves were about 12 inches long and 7 inches wide. The formerly thread-like taproot now had a thickness of 7 millimeters near the soil surface and 2 millimeters at a depth of 1 foot, below which it tapered to 1 millimeter and then to less than 1 millimeter in thickness. Aside from slight curves it penetrated almost vertically downward to depths of 40 to 46 inches. The general root plan had not changed (Fig. 66). As before only relatively few short branches occurred in the first 3 inches of soil. Below this level they became longer, those originating at depths of 5 to 12 inches sometimes extending 9 inches (maximum, 22) rather horizontally away from the taproot. In the still deeper soil even the longest branches seldom exceeded 6 inches. Most of the branches were quite fine, usually only four to six per plant reaching 1 millimeter in thickness. Occasionally, however, one of the finer branches enlarged near its end to this diameter. The rate of branching averaged eight per inch in the surface foot (aside from the surface 3 inches) and somewhat less in the deeper soil. Thus the rate of branching had not increased over that of the preceding examination. As before, moreover, numerous simple, short branches were intermixed with the longer ones. These were usually only 1 to 3 inches long. Only the longer branches were supplied with rootlets. They were mostly 0.1 to 1 inch long and seldom exceeded two to four per inch in number. The roots were fine and white in color, except that the oldest ones were yellowish. They were nearly always poorly rebranched. The horizontal position of the laterals is characteristic. Aside from absorption by a few branches which extended more widely, the plants were securing their entire nutrient and water supply from soil volumes about 3 feet deep and less than 1 foot in any of their diameters. This limited root area is probably correlated with the character of the tops. Plants in Autumn.--At the final examination, Oct. 5, the plants averaged 17 inches in height. Each had from 14 to 28 leaves and a spread of tops of approximately 21 inches. The large leaf blades were about 12 inches long and 7 inches wide. The taproots had increased greatly both in thickness and depth. Near the soil surface they were often 2 inches in diameter but tapered to 0.5 inch at a depth of 1 foot. At 2 feet they were still 5 millimeters thick and 3 millimeters at 3 feet but below 8 feet less than 0.5 millimeter in diameter. At the 8-foot level roots were common and a maximum penetration of 9 feet was determined. In the surface 10 inches of soil frequently 20 laterals over 1 millimeter thick and 70 smaller ones took their origin. Thus apparently a few new laterals had grown from this portion of the taproot. Many of the smaller roots were short, others were 20 to 30 inches long. Most of them. were unbranched or nearly so. The larger ones extended more widely, sometimes to distances of 3 feet. These were clothed with branches 0.2 to 2 inches long at the usual rate of five to eight per inch. Only the longest were rebranched and even these were not rebranched profusely. In the deeper soil, to 4 feet, branches were somewhat fewer and in general did not extend so far laterally. No large branches were found below 4 feet. But even below 8 feet two to four laterals originated from 1 inch of the shining white roots. The characteristic odor of the fleshy parsnip root was observed even near the root ends. A habit noted on a number of plants was that of the division of the taproot at a depth of about 3 feet into three to five almost equal parts. These often ran outward 2 to 4 inches and then, turning downward, extended more or less parallel to depths of 8 to 9 feet. Branches on these were like those on the taproot, hence the absorbing area was considerably increased. Where this division occurred, other major branches sometimes arose below the 4-foot level. As a whole the root habit had changed very little from that of the preceding examination. The most important differences were the great increase in depth (from 3.7 to 9 feet) and the accompanying growth of laterals in the deeper soil. The original branches, of course, had considerably extended their absorbing area but nowhere was a profuse network of rebranched laterals evident. Just how much the maturing plant depended upon this newer portion of its absorbing area and to what degree the older portion had become non-functional is an important problem awaiting solution. Growth of Roots during Winter and Spring.--Studies of the root system at Norman, Okla., early in December and again Feb. 28, showed that the parsnip, unlike the carrot had made no new root growth. A month later the tops showed considerable new development and simultaneously a number of new roots began to grow from the crown near the surface. These roots were of little importance, however, in increasing the absorbing area. But small roots on the larger branches in the surface foot of soil also showed renewed growth. By increase in length and by the development of abundant laterals, the efficiency of the root system was greatly enhanced. Mature Plants.--Mature parsnips of the Improved Hollow Crown variety were also excavated in Oklahoma, May 30, during their second year of growth. The plants had been thinned to 2.5 feet apart in the 36-inch rows at the beginning of the second season. Cultivation throughout had been done with a mulching fork and did not exceed 2 inches in depth. The plants were 4 feet tall and in addition to the main stem each had three to four branches from the crown. The main stalks bore numerous branches and flowering was profuse on all. The leaves were still green and thriving. The strong taproot was 2.5 inches in diameter at the crown and tapered gradually to 5 millimeters at a depth of 2 feet. 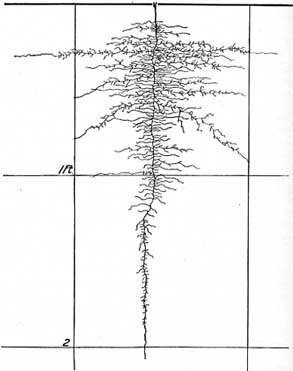 Seven strong laterals, 3 to 5 millimeters in diameter, originated on the first 16 inches of the taproot. In addition there were 58 laterals at least 1 millimeter in diameter and numerous clumps of 5 to 14 finer rootlets. A lateral spread of 4 feet and a depth of over 6.5 feet were attained. 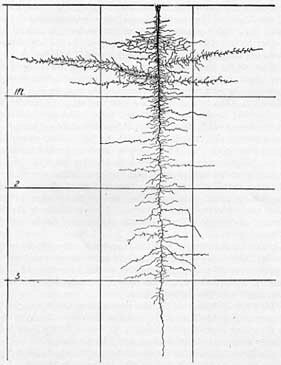 The thorough occupation of the surface soil, as well as the extent and degree of branching in the deeper soil, is well shown in Fig. 67. For the sake of clarity many of the smaller rootlets are not shown. Water and available nutrients were obtained from a very large soil volume. Fig. 67.--Mature root system of Improved Hollow Crown parsnip. The plant was excavated at Norman, Okla., on May 30 of the second season of growth. Many of the finer laterals are not shown. Summary.--The parsnip, like the carrot, has a very extensive taproot system. When only four leaves have developed, the taproot reaches the 2-foot soil level and is well furnished with laterals throughout. These are slow, however, in developing secondary rootlets. The surface soil is not well occupied during the early life of the plant. A month later the taproot extends almost to the 4-foot level. Except for a few horizontal laterals, 12 to 22 inches long in the second 6-inch level, the taproot is quite uniformly branched to a depth of 3 feet. The branches are mostly horizontal, 1 to 6 inches long, and poorly, if at all, rebranched. In October, large, leafy plants have taproots 2 inches thick and 8 to 9 feet long. The number of main laterals in the surface foot has been somewhat augmented. A lateral spread of 3 feet has been attained. Branching is not profuse. In the deeper soil branches are fewer and less widely spreading. No large branches occur below 4 feet. Thus the absorbing system is not so well developed as in the carrot and many other vegetable crops. Plants grown in sandy loam have a similar habit except that they are not so deep but somewhat better branched. Renewed growth of roots in spring occurs synchronously with that of tops. Growth during the second season consists in part of the development of numerous long roots just below the soil surface but largely of the extension and profuse branching of the smaller laterals already found the preceding season. Strong taproots, 6 to nearly 7 feet long and now profusely branched throughout, fill the soil. A wonderful network of absorbing rootlets ramifies the surface 16 inches of soil to a distance of 3.5 feet on all sides of the plant. At greater depths a column of soil 18 inches thick is also well occupied. Root Habit in Relation to Cultural Practice.--A study of the slow germination and growth of the parsnip, together with its early development of delicate rootlets, makes clear why a deep, rich, open soil is best. It will not bake and form a crust over the seeds or about the seedlings. Branched, crooked, and misshapen roots, common to shallow and lumpy soils, will not be formed under such conditions. Early, shallow cultivation to prevent weed growth and possibly to conserve moisture is desirable. Later the vigorously developing roots, extending widely through the surface soil and deeply into its moist layers, are able more successfully to make the best of their surroundings and even to compete with weeds. By growing plants thickly, i.e., 4 to 8 inches apart in rows 14 to 18 inches distant, sufficient space is insured and enough competition afforded to develop roots of desirable size.